"365 acres with frontage on, and under, Lake Champlain is for sale in northern New York," the Center for Land Use Interpretation reports. "The property comes with a 19th century fortification, Fort Montgomery, that while in need of some repair, is still largely intact. Furthermore, the property abuts the Canadian Border, making this an excellent opportunity to add to the defense of the nation." And it can be yours for a mere $10 million. 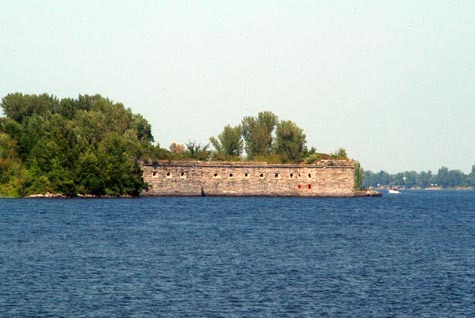 Best of all, Fort Montgomery is located "on an artificial island, linked to the shore by a causeway." Further, the fort "was built in a five-pointed star formation, in a manner more typical of a coastal fortification, and a type that is rarely found in the interior of the country. It has 40 foot tall stone walls projecting out of the water, though portions of it were removed in the 1930s during the construction of a nearby bridge." So why not add it to your portfolio – along with this lovely ghost town?